The thermal environment (TE) inside livestock and poultry facilities has a substantial impact on animal growth performance and facility energy usage; therefore, the TE must be quantified correctly to maintain the optimal TE that maximizes feed efficiency and consumes minimal resources. To achieve this goal, a TE sensor array (TESA) and accompanying data acquisition system were previously developed to measure dry-bulb temperature (tdb), black globe temperature, airspeed, and relative humidity (RH). While measurement of each parameter is useful individually, it is more informative when they are combined to estimate and assess the total impact that the TE has on an animal. 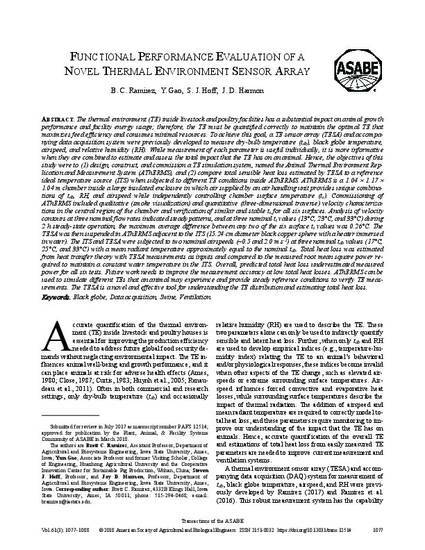 Hence, the objectives of this study were to (1) design, construct, and commission a TE simulation system, named the Animal Thermal Environment Replication and Measurement System (AThERMS), and (2) compare total sensible heat loss estimated by TESA to a reference ideal temperature source (ITS) when subjected to different TE conditions inside AThERMS. AThERMS is a 1.04 × 1.17 × 1.04 m chamber inside a large insulated enclosure in which air supplied by an air handling unit provides unique combinations of tdb, RH, and airspeed while independently controlling chamber surface temperature (ts). Commissioning of AThERMS included qualitative (smoke visualization) and quantitative (three-dimensional traverse) velocity characterizations in the central region of the chamber and verification of similar and stable ts for all six surfaces. Analysis of velocity contours at three nominal flow rates indicated steady patterns, and at three nominal ts values (13°C, 23°C, and 33°C) during 2 h steady-state operation, the maximum average difference between any two of the six surface ts values was 0.26°C. The TESA was then suspended in AThERMS adjacent to the ITS (15.24 cm diameter black copper sphere with a heater immersed in water). The ITS and TESA were subjected to two nominal airspeeds (~0.5 and 2.0 m s-1) at three nominal tdb values (17°C, 25°C, and 33°C) with a mean radiant temperature approximately equal to the nominal tdb. Total heat loss was estimated from heat transfer theory with TESA measurements as inputs and compared to the measured root mean square power required to maintain a constant water temperature in the ITS. Overall, predicted total heat loss underestimated measured power for all six tests. Future work needs to improve the measurement accuracy at low total heat losses. AThERMS can be used to simulate different TEs that an animal may experience and provide steady reference conditions to verify TE measurements. The TESA is a novel and effective tool for understanding the TE distribution and estimating total heat loss. This article is published as Ramirez, Brett C., Yun Gao, Steven J. Hoff, and Jay D. Harmon. "Functional Performance Evaluation of a Novel Thermal Environment Sensor Array." Transactions of the ASABE 61, no. 3 (2018): 1077-1088. DOI: 10.13031/trans.12514. Posted with permission.